~ Limit 4 per person! ~ Doors Open and Bottle Tickets are handed out starting at 2pm. *if you receive a numbered bottle ticket, you will be able to purchase a bottle on Friday the 15th. *Special Release Day price, should any bottles be available after the release day, they will retail for $11.99 each. Also Available the MOTHER OF ALL FLIGHTS! 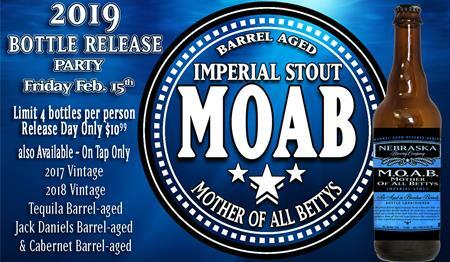 MOAB is a Monster Bourbon Barrel Aged Imperial Stout takes 'Betty' to a whole new level. We've used twice as much grain and double mashed it, so this beer gets all of its stickiness, sweetness, and alcohol from the malt, and not any extra sugar additions. We then we add an aggressive amount of Warrior hops to balance the sweetness of all that malt! Finally, we aged this beer for 6 months in a careful blend of 3 different American Craft Bourbon barrels.